MagnaStone US patents 7648454, 7803104, 8202192, 7915846, 8050059, 8257242, 8469872 is a instrument designed to generate a sinusoidal magnetic field that has been proven to have therapeutic value. This therapy has been effective in the field of orthopedics and depression. This is believed to stimulate cellular repair by concentrating the hemoglobin (the blood protein that carries oxygen) to the cellular damaged area. The exact mechanism of how it works is not fully understood. 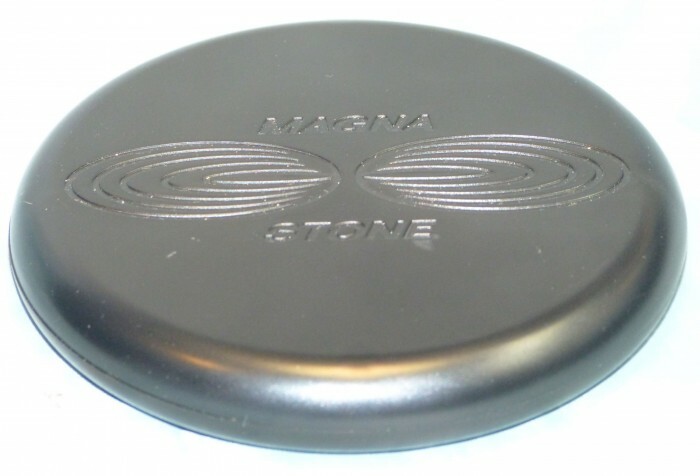 The design of the MagnaStone allows for the enormous dynamic (sinusoidal) field strength to be housed in a hand held device a little bigger than a hockey puck is so unique that the US Patent Office saw fit to issue 7 patents. With dimension of 4.5" round and 0.75" thick, makes the MagnaStone one of the smallest and most powerful unit on the market today. The design of the MagnaStone uses 10 neodymium magnets each generating a magnetic field of 3,000 gauss. 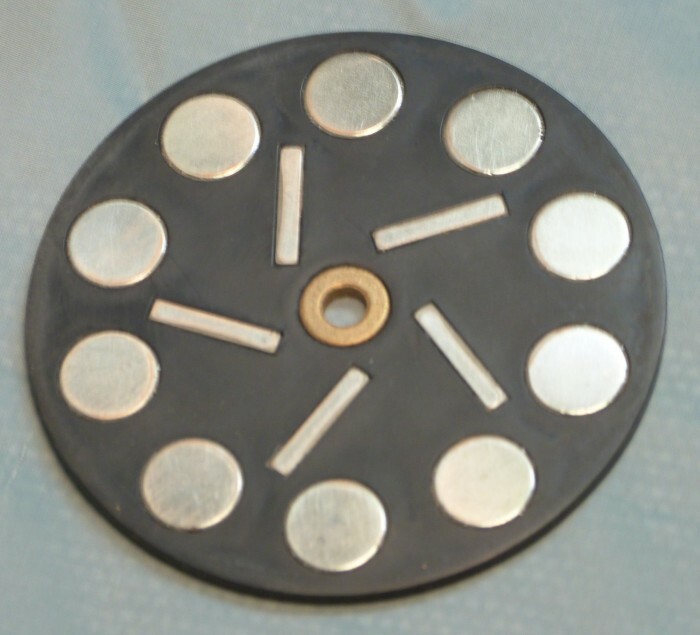 The magnets are mounted on a disk equally spaced with alternating N/S, S/N orientation. By rotating the disk the field changes from a static field to a dynamic sinusoidal field. The field strength is about 0.30 Tesla (10,000 Gauss = 1 Tesla) at any point on the disk that the magnets rotate through. The accumulative field of 10 magnets is about 3.0 Tesla. In addition to the therapeutic magnetic fields that the magnets generate, they are also used to create the rotational motion for the disk. This is accomplished by using a 3 pole electromagnet and a Hall-effect transducer under microprocessor control, effectively creating a brush-less motor. The rotational speed of the disk, which is controlled by the microprocessor, determines the sinusoidal frequency of the magnetic field. The MagnaStone is composed of two sections, the Stone and the Cradle both made from injected polycarbonate for strength and durability. The Stone, the section used for therapy, contains the neodymium magnets and all the electronics. The Stone is powered by lithium ion batteries located internally. 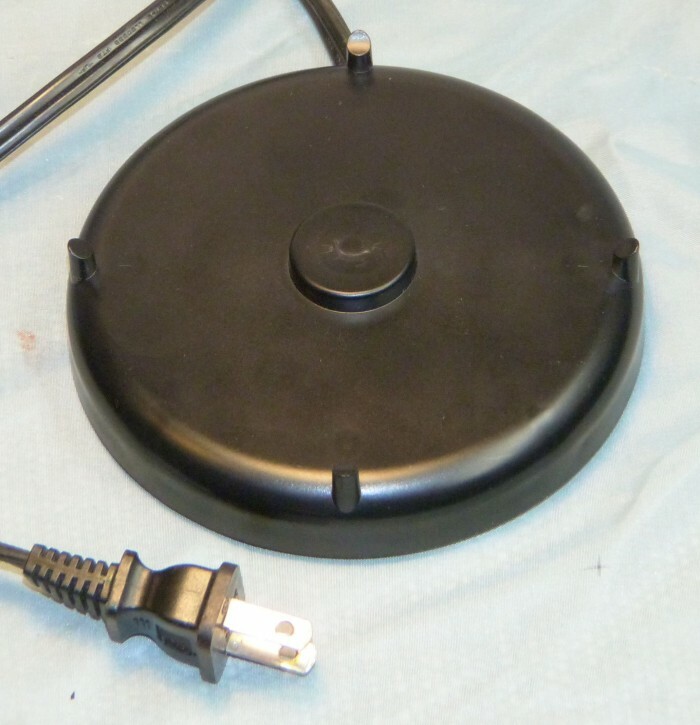 When not in use, the Stone sits on the Cradle to recharge the lithium ion batteries. Charging is accomplished by an inductive magnetic field coupling which requires no wires or contacts between the Cradle and the Stone. This insures the Stone is totally sealed and impervious to outside environment so it can be used in wet locations, such as a sauna, whirl pool, bath tub or pool. The therapy session begins when the Stone is removed from the Cradle. The session is preprogramed for 20 minutes and can be terminated at any time by placing the Stone back on the Cradle. In order to keep the MagnaStone as simple and reliable as possible, there are no controls (switches) of any kind to operate. All functions are controlled internally by a microprocessor. The Stone has both audible and visual indicators to show the progression of the therapy session. In addition, when the Stone is on the Cradle it will indicate the state of charge on the lithium ion batteries. There are nine blue LEDS for visual and piezoelectric generated tone for audible effects. 1. Magnetic field strength is determined by the particular magnets used. 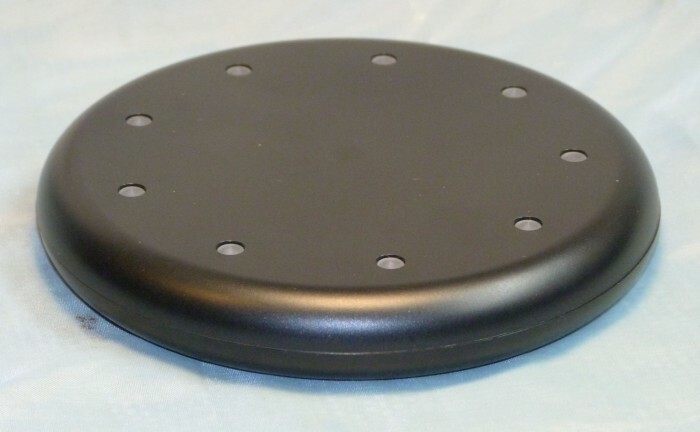 For this design we choose the strongest magnets that the enclosure can accommodate, which is about 0.3 Tesla. 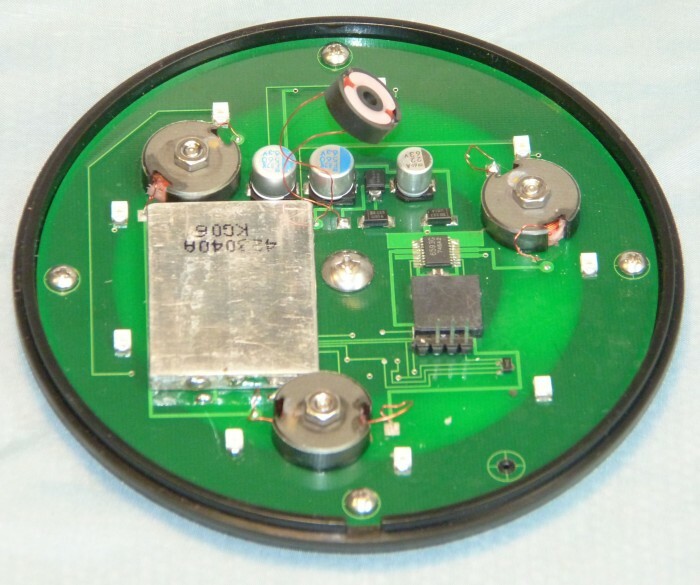 This design can be scaled up or down by using larger or smaller magnets with little or no change to the electronic design. The mechanical design will need to be altered to accommodate the size of the magnets used. 2. Field modulation is determined by the technique used to generate the magnetic field. For our design, the magnets are mounted on a disk equally spaced with alternating N/S, S/N orientation and then rotated. This will always generate a natural sinusoidal field. This is fixed in the design and can not be altered. 3,4. Duration of therapy (session time) is determined in software and can be any value from a couple of minutes to several hours. In addition the frequency of the magnetic field is also determined in software and can be any value from 0.1 cycles per second to 1000 cycles per second. Since the MagnaStone has not seen any clinical trials and there are no similar devices on the market, the session time and frequency will need to be determined in an actual clinical environment for the best therapeutic results. Our initial starting point is 20 minutes and at 100 cycles per second (100 Hz). There are 7 US patents 7648454, 7803104, 8202192, 7915846, 8050059, 8257242, 8469872 covering the design of the MagnaStone and are for sale for $385,500.00. Please note the MagnaStone design is almost complete and very close to building production units. In addition, all engineering data along with rights to the injection molds and all component including prototypes can be made available. If required I will make my engineering services available to further help bring the MagnaStone to market if desired. 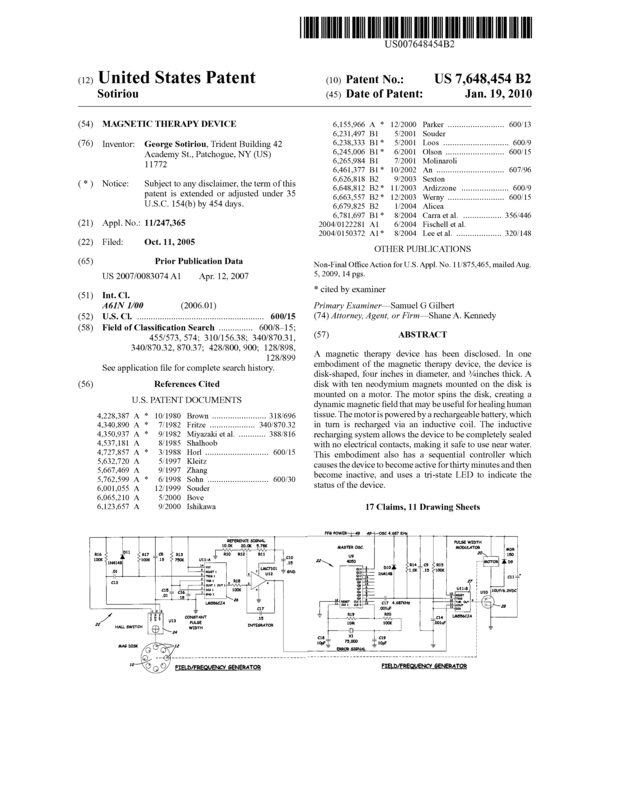 Page created at 2019-04-22 14:08:25, Patent Auction Time.